Don’t you sometimes feel that Social Media Marketing is like quicksand? This everchanging world can certainly be overwhelming to business owners who work hard on their marketing strategy. The good news is that there are ways to monitor the changes, decide whether they affect you and adjust accordingly. Before presenting the oars to guide you safely through the quicksand, it is important to understand that the underlying principles of Social Media Marketing are timeless. They are the firm ground by the quicksand that will allow you to hold on to, even when the oars seem weak. Social Media platforms are the new ‘Town Square’ or traditional ‘Marketplace’ where business owners and customers meet face to face and engage in conversations. This is one of the 5 principles that drive Social Media marketing according to Mark Schaefer in his book Social Media Explained. Once you understand this, finding your business voice and serving your content on different platforms according to your goals are two oars that will keep you from sinking into any quicksand along your Social Media marketing path. There are new sites and tools that come to light every single day and you should avoid the Shiny Object Syndrome as explained by Jennifer Hanford. There is no need to know about all of them as they are created. You must remain focused on your goals and the implementation of your strategy and keep monitoring new platforms and tools until they become mainstream or relevant. How can you monitor and decide when you should consider adjusting or adopting a new tool or platform? There are many recommendations out there and I could suggest to you to read articles from trusted sites to stay updated, to look at your site analytics every so often, but the truth is, it DEPENDS on your time and expertise availability. If you don’t have much of either, better go ‘with the masses’. What do I mean? Don’t get on board a new social media platform until you know that it is REALLY worth it and in line with your own ‘Pillars’ of Branding, Goals and Action Plan. Avoid getting sucked into Vanity metrics that serve no business purpose. Here’s a Warning on Tools and Stats. create an interest list on Facebook or setup Pages to Watch as explained by Andrea Vahl. Choose any of these ways to monitor changes but remember to adjust it to your own capabilities and needs. Frequency is Key! These are tasks that must be done, just stay away from them becoming an obsession. Decide beforehand on your optimal frequency and stick to it: there are daily, weekly, monthly, quarterly and yearly tasks to cover. In order to decide whether a new tool, a new platform or changes in the way they operate will affect you, it is paramount to find your voice and answer the ‘Only we….’ question mentioned by Mark Schaefer in his book Social Media Explained. Once you know what sets YOU apart from your competition, you’ll be able to decide on whether to implement changes on the way you’re managing your Social Media marketing. Maybe a new platform will be perfect for your voice, like Instagram for artists who can show who they are by sharing what inspires them and behind the scenes photos. Jamie Teasdale on the Steamfeed.com blog on Why your business should develop a brand voice regarding WHAT you say and HOW you say it. Dorien Morin also wrote an article for Steamfeed in which she points out 10 steps to find and develop your Social Media voice. Another key factor is consistency and here are 12 elements that are essential in creating a consistent brand voice according to Dr Andrew Bredenkamp for the Content Marketing Institute. Once you are aware of a trend you must follow so as not to be left behind by your competitors, you should revise your current action plan and make changes in the short, medium and long term. Starting on a new platform will require time to get to know how it operates and how your business can benefit from a presence there. It is not until you actually start posting that you’ll get the feedback needed to know whether it was the right move. In a fast paced environment, you’ll have to decide quickly and test along your already in place strategy, to see how you’ll implement in your next season’s strategy. The good news is that once you know who YOU are, it’s a lot easier to project yourself on any given platform. The platform itself will help you understand how to behave. You are YOU but you’ll dress differently according to the time of day, the season and the venue you’re in. Treat Social Media platforms the same way. If you’re unsure as to how to behave, ‘listen’ first, lurk a little and then start sending signals and see what comes your way. When Facebook reach decreases, there’s high engagement on Instagram. For every short lived tweet, there’s a long lived pin. A simple change like posting more Status updates on Facebook can make up for photos lower reach. Testing is essential and should be the first step towards adjustment. Look at your budget and decide to relocate funds according to ROI. It is also part of the strategy. Always plan according to your goals and adjust along the way. If you need help, hire a professional marketer, even if just for consulting. It will be worth the investment. 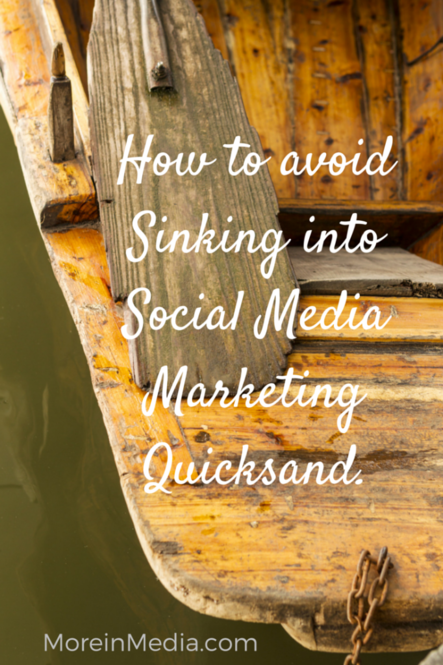 Have you been trapped into Social Media Marketing quicksand? How did you manage to escape? Would love to hear from you and learn from your experience. Thanks for sharing!